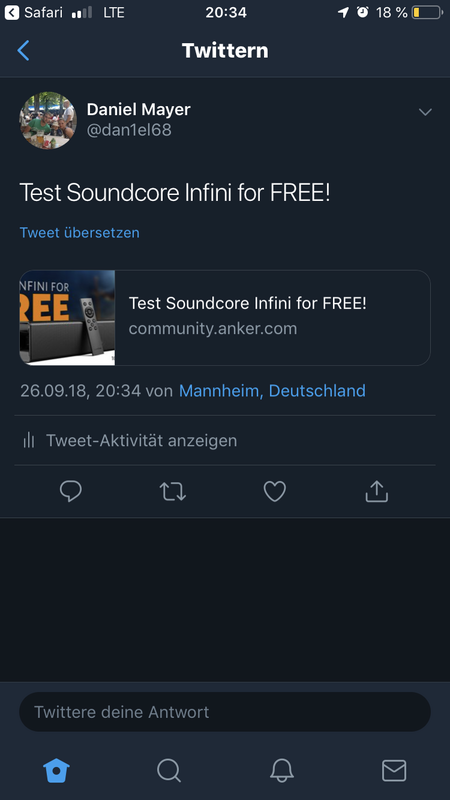 Thank you, @Ankerofficial and @SoundCore for this lovely opportunity! I have been in the market for a soundbar, but unfortunately my better half is keeping the man down! My plan on testing goes as follows. This 100W, dual subwoofer, dual tweeter is just the product for me! I would love to be submerssed in the world of Elsa and Ana and turn the volume up and “Let it Go” as loud as I can with my daughter. I will watch Khalil Mack and the Bears pull a rabbit out of a hat and destroy Fitz-Magic. I will of course watch pregame and post game to test out the dialogue settings. 35 Inches - I will use a ruler and confirm this. Maybe even a yard stick for a fun visual. Dual Built-In Subwoofers - This is exciting! I’ve never had two subwoofers. BassUp Technology - I will turn the Bass UP and try to blow my windows out. Music, Movie, and Dialogue Modes - Yep! You guessed it, I will listen to music, watch a movie and listen to people have a conversation. I might even have a conversation with my family to see how they compare SXS! Flexible Placement - I will put this on my cat, in my hat and on my wall in the fall. Remote Control and Integrated Buttons - I will put batteries in the remote and point it in the vicinity of the Infini and try to turn the volume up and down. I have done many Anker reviews and would love to do another. This will be posted to Amazon, Reddit, Twitter, YouTube. I will provide details on the unboxing, plug in and set up. I will also compare to other speakers such as the Soundcore Flare, Anker Pro as well as my Jawbone, Logitech X3000. Best of Luck to all, and thanks for the consideration! 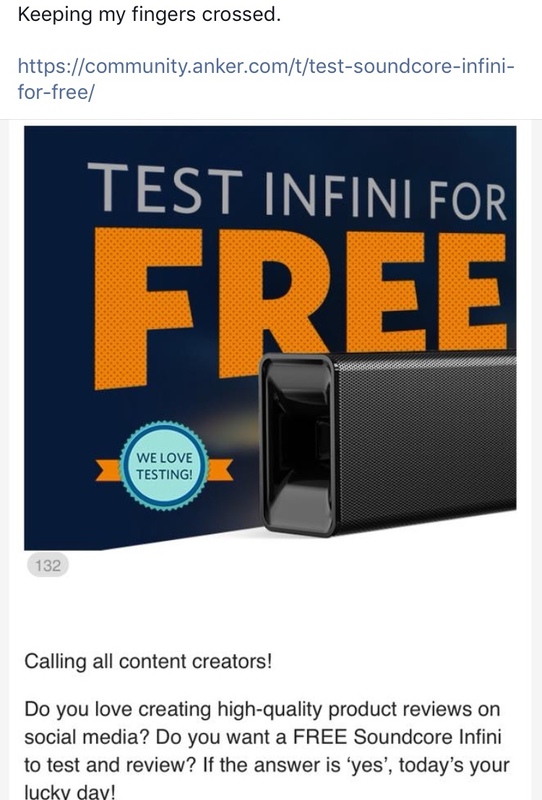 Is this the soundbar you said would be released in UK? Unboxing - How the packaging looks, how is the product displayed, and how easy was to remove and find everything. First Impressions - Built quality of the products and accessories. Sound - Test quality for movies, TV shows, News, streaming radio/movies. With Test with actions, dramas, comedies. Lots of pictures taken throughout the testing phase. So my plans to the recording. I am going to one upload it to my YouTube channel at https://www.youtube.com/channel/UCeeLH7vk86xsVU__ZDrEibg? 1. I will start the video with a shout out to Anker for letting have this great opportunity. 2. Then I will unbox the Soundcore. 3. I will listen to some NCS music from my phone using Bluetooth. 4. Then I will compare this to the sound system we have at home using the AUX cord. 5. This will then see if the sound quality and see if it changes via input. 6. While I do these past 2 steps I will compare sound loudness of the systems. 7. Then lastly I will shout out out Anker again and close the video. 8. To contact me do it on Twitter @ThatTechKidYT and to validate everything. 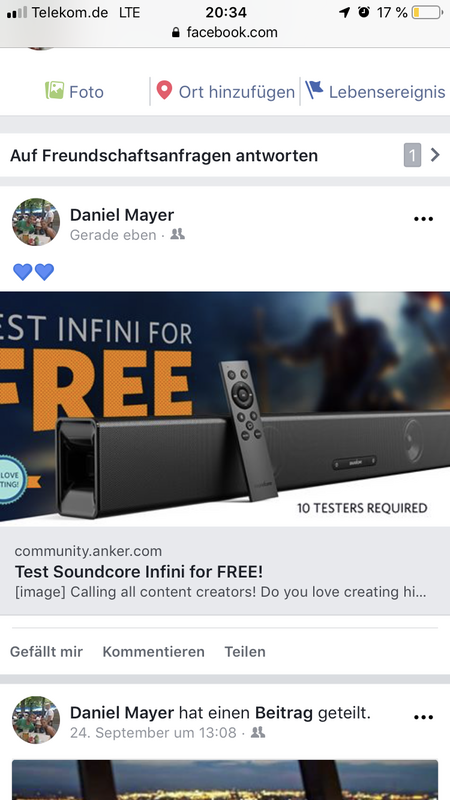 I would like very much to test the sound bar. I am new to the community but I have been a very loyal Anker user for many years! I look forward to becoming an active part of the community. Compare with my current soundbar on size and sound. Connect it to my phone via bluetooth to test the connection and sound quality. I would also like to test the sound bar both at home and office settings as I have set ups in each space and the environment is different. I have shared this on both Twitter and Facebook and can share this on multiple sites as recommended. Thanks for this latest testing event! I am a professional photographer based in New York City with a large following on social media. I've also been a pro club DJ for 20+ years and have done High Fidelity & video installations. I am also a computer system builder. 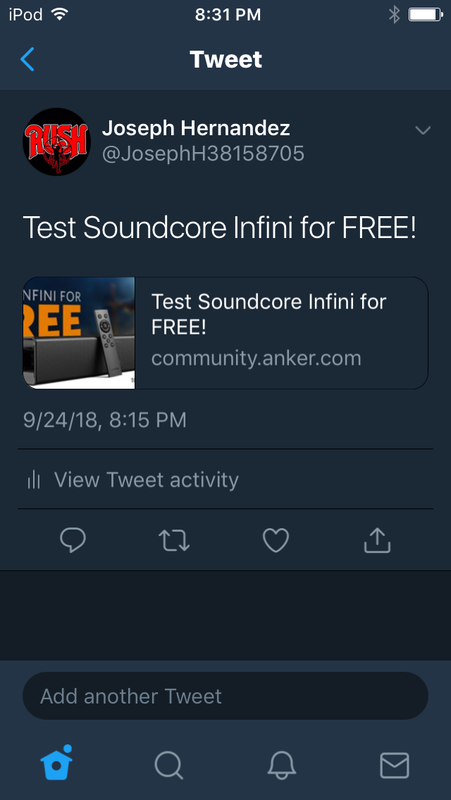 I'm interested in testing & reviewing the Souncore Infini. I would take professional product photos of the unit before testing to show the detail and quality of Anker's craftsmanship via lifestyle photos in my home, either at my computer workstation or at my Home Theater setup in the living room. With that in mind, I'd test the sound with different applications & genres such as movies, sports and concert broadcasts. I'd also test the Apple-looking remote that's included. I am an experienced reviewer & influencer with Anker (and others) and post many of my reviews on my large 26K Following Facebook page at the Tech Reviews album here: https://www.facebook.com/dezsantanaphoto/photos/?tab=album&album_id=1132162860167743 as well as my other social media outlets such as Twitter and Instagram. I hope @Anker considers me in this round and good luck to all! I remember you said that your mailbox is small, but this item is too big!!! You borrowed a Nebula Capsule from your friends? You are going to want to attach a screenshot of the post to twitter. 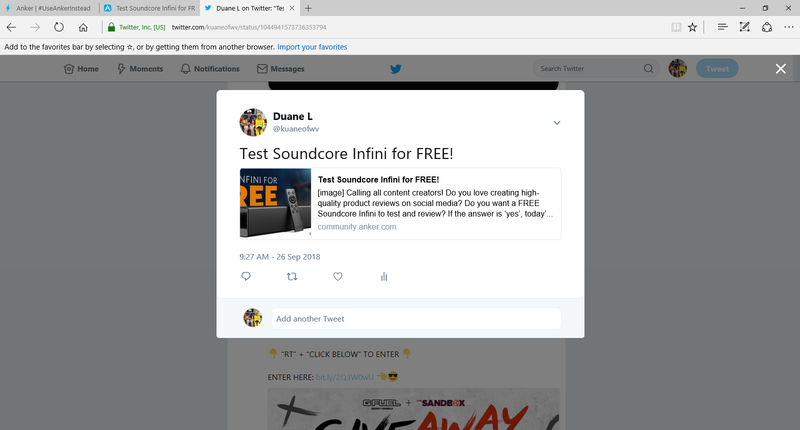 1.Share this event on your Facebook or Twitter and leave your review plan for Soundcore Infini in the comments below with a screenshot of your the shared event on your social media. Not sure if you're aware, but there a thing, where the postman knocks your door and hands you your parcel! It's only America where post is dumped in a box at the end of the path. So no trying harder than usual for me not to win.... Of course, if I don't win something now, I'll be suspicious that I was left out deliberately. First part of the test would be to read up on everything that it does and it would be to test the device to those different specs. If it has Bluetooth, I would test how easy it was to connect to it. Another test would be to test the distance that it was able to connect and how far it will stay connected before it loses signal. I have a PS 4 so I would really love to see if it would connect to my PS 4 (PS I would love ya a lot if it did) as it would be good option to get get surround sound with out having a lot of speakers to get that effect. I would check if it would connect to my echo as well. Plus other scenarios that I can think of for Bluetooth related items. I would compare it to my current speakers in my play room. Size, sound, bass, clarity and etc. I know with my TV that it vibrates when the sound gets load. SO a sound bar is a must. Will check if it has any sound distortions when the volume gets loader. I love remotes and if they are easy to use and button placements. I think a comparison of the specs with other devices and their price vs this products price. I have also tested the Spirit X earbuds for you recently. Plus my current job is a business analysis that test and help develop a software program for the State of WV. I am that tester that usually test outside the box. Thanks for any chance as I love your website format and is different in your approach to customer service and interactions. I plan to do a full unboxing and review on my YouTube channel.